Roughly 80% of all goods in the U.S. are transported by semi truck drivers, with about 350K of those drivers being owner-operators. Building a transportation company of any size requires you to buy rigs, which are expensive. Semi truck financing is a popular method to fund these purchases amongst owner-operators and small transportation companies. In this article we’re going to discuss, step by step, how to get semi truck financing and what might prevent you from getting approved. Smarter Finance USA can qualify borrowers for up to $100K in semi truck financing if they have a 600+ credit score and a down payment of at least 5%. 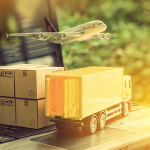 They offer both leases and loans for semis, and their familiarity with the industry can help borrower’s obtain financing fast. We’re going to cover all 5 steps in detail and then share with you the main things to watch out for which could prevent you from getting approved. Before you apply for any form of financing, you need to make sure you can qualify. Many semi truck financing options have similar qualification requirements because the truck you’re buying is securing the loan. The combination of the truck’s value and your down payment typically eliminate most of the risk for your loan provider. All qualifications will vary by loan provider, but if you can meet the requirements above then you’ll typically have a good chance at getting financed. The time with your CDL license is important because it shows the loan provider that the truck is going to be used by an experienced driver immediately. The provider doesn’t want the truck to go unused without it bringing income into the business, but they also don’t want to risk an inexperienced driver using the truck because it will be used as collateral for the loan. If you meet these qualifications and are ready to move forward with your semi truck loan, you should consider using Smarter Finance USA as your loan provider. They are very familiar with the trucking industry and can get you funded for up to $100K. The next step is to gather all of the information you’ll need to provide to your lender. Having the documentation ahead of time will enable you to speed up the process, and it tells the loan provider you’re ready to make a large purchase. Plus, trucks can go fast if another buyer swoops in with an all-cash offer. So before you find the truck you want, you should make sure you’re ready to move forward and close a financing opportunity. Once you have all of this information on hand then you’re ready to go out and find the right truck. Once you’ve found the right truck that you’re ready to move forward with then you need to move quickly so that you don’t lose it. There may be cash buyers or other buyers further along in the financing process who could come along quickly to buy the truck out from underneath you. Before your loan finalizes you’ll need to show the loan provider that you have proper insurance for the semi truck. The average cost of a commercial truck accident is $59,150, which could damage your business’s cash flow, or hurt your loan provider’s collateral if you aren’t properly insured. This is why proof of good insurance is at the top of your loan provider’s list before you can close on your loan. You can typically start steps 4 and 5 at the same time, because you can get pre-approved without having insurance. However, you won’t be funded until the loan provider receives acceptable documentation of the vehicle being insured. If you’re a business with an office and/or employees, then you will also likely need a general liability coverage policy and a worker’s compensation policy. The larger your business is the more coverage you’re likely to need. The cost of your insurance will vary greatly based off of your driving record and the claims record of your business. The value of the truck, the amount of mileage on the truck, and how much you expect to drive it monthly will also play a factor in your costs. We recommend consulting with a truck insurance expert that is familiar with your industry before deciding on what coverage to get. Once you’ve finished with everything in the first four steps, you’re ready to officially apply and get approved for semi truck financing. You should make sure that you get details and a complete list of everything your financing company requires before you submit any documentation. A strong financing partner, like Smarter Finance USA, will help you with this so that you don’t delay the process by having to go back and forth with them on small pieces of information that could have been provided up front. Semi truck financing can refer to either an equipment lease or an equipment loan. The differences between the two are significant and you can read more about them here. The biggest difference is that any form of an equipment loan is where you will own the equipment at the end of your financing term. An equipment lease is an arrangement where you pay to borrow the equipment until the end of the term when you then give it to the financing company. If you’re wanting to move forward with financing, you should use an equipment lease calculator to determine what your monthly payments might be so that you can know how much you can afford. Smarter Finance USA is a provider that can help you get approved for up to $100K in equipment financing, and they can structure it as either a loan or a lease. If you have a 600+ credit score, and 5% to put down, then you should visit them today to see what you can qualify for. Once your financing is approved, and the loan closes, you can start using your truck to bring income into your business. Payments will begin shortly after you close your loan, so you’ll want to get the truck operating as quickly as possible. You will also likely want to lower your truck operating expenses, because once you have your rig your attention will typically be redirected to managing your cash flow. Getting the right fuel card, or a fleet card for larger transportation businesses, could save you money and help spread out your cash flow obligations instead of paying for gas immediately when your truck is on the road. If you need additional financing in the future, you should look at the options for business loans for truck drivers and trucking companies. You may also want to consider how freight factoring can get you advanced payment for your outstanding invoices. Now that you understand the steps it takes to get financing, you should make sure you pay attention to the small details of your application that may deter you from getting approved. Whenever you’re getting financing, it’s important to be thorough in the small details of your application. One wrong step or attribute could stop you from getting financed. This could be even more frustrating to you if you’ve spent a significant amount of time trying to get approved when you could have corrected the issue before you applied. Most loan providers will want to see 2+ years of operating history before they lend you a large amount of money. Being a newer business may not stop you from getting a loan, but it could cost you more money. Smarter Finance USA can get you funded as a startup as long as you have industry experience. How to Overcome This: Negate the loan provider’s risk by having a large down payment. If the value of your truck and the amount you’re willing to put down for it equals the loan amount, then your chances of getting approved are much higher. How to Overcome This: Once you check your credit score, you can then work at improving it, or bring on a cosigner with a strong credit profile. You may be able to find a loan provider willing to work with you if you can provide a large down payment, or have a cosigner with a healthy credit profile. Buying your truck from an unknown private party is a risk for a loan provider. There are over 15.5 million trucks operating in the U.S. alone, and they’re all in various conditions. The equipment financing company may not be comfortable with the truck’s condition or whether or not the documentation is all correct. How to Overcome This: You can buy your truck from a known business or seller. A person or business who is known in the industry and has a history of selling semi trucks. If this isn’t possible, then we suggest getting as much information as possible about the private party you’re buying from before applying for financing. It is difficult to get most types of financing if your business has a history of struggling with cash flow. How to Overcome This: If you currently have low cash reserves we suggest finding ways to tighten your budget to show more cash in the bank. If this has been a struggle, then putting together detailed proformas showing how the new truck will improve your cash flow operations would be very beneficial for your loan provider to see. If your truck is older than 10 years then you’ll find it very difficult to get financing. Being an old truck also relates to mileage as well. A truck with 700K miles on it, or more, is not likely to get financed. Older trucks breakdown more frequently, and they give the loan provider less value for collateral to protect the money they loan you. How to Overcome This: Find and buy a truck that is younger. Older trucks might be nice additions to your fleet if you’re purchasing one in good condition for cash, but when you need to finance them they need to have less years and miles on them. The Process Can Be Faster: They’ll know what documents are important to analyze your business profile. Better Chance at Getting Approved: Semi trucks are very specific equipment that can be difficult to determine a value for if you’re unfamiliar with them. A provider experienced in offering financing in your industry will know how to analyze your information and the value of your truck to best benefit you. Lower Down Payment: Providers that don’t lend in the transportation space very often may require a larger down payment to secure your financing. This is done to cover any potential risk they may not be aware of. Lease Purchase Opportunity: Using a lease purchase can have certain accounting benefits to your balance sheet. Traditional lenders may not offer this option, but loan providers who frequently lend to the transportation industry will generally be more comfortable with the process. Our recommended provider for semi truck financing is Smarter Finance USA. They are very familiar with the trucking and transportation industry, doing many loans throughout the industry each year. If you have a 600+ credit score and a down payment of at least 5%, then they could qualify you for up to $100K to purchase your new or used semi truck. You can get semi truck financing in the form of either a lease or a loan. 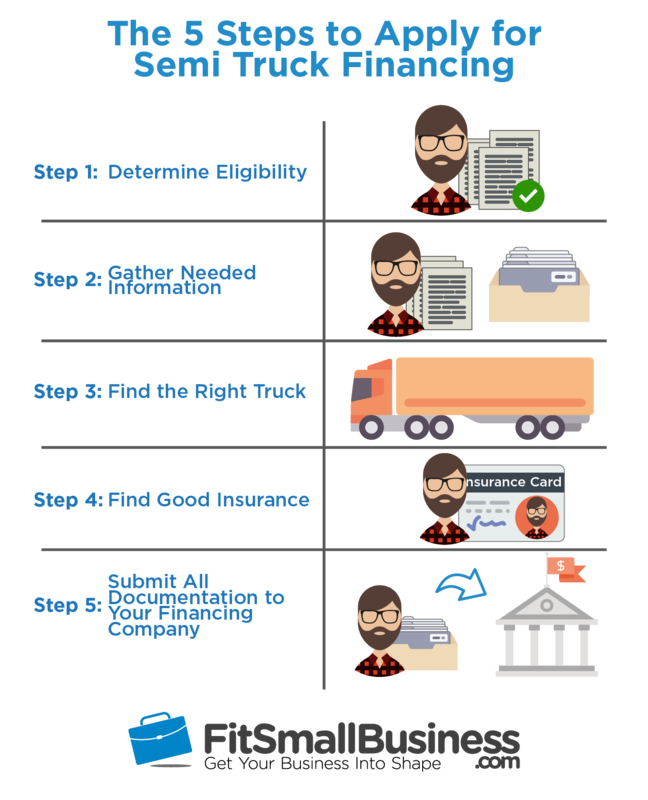 Reading our five steps to applying for semi truck loans should have helped you better understand the process so that you can prepare to get financed. Following the steps closely, and paying attention to the small details of your loan application will set you up to find the financing you need to purchase your next semi truck. If you’re ready to apply, Smarter Finance USA is the best semi truck loan provider we’ve reviewed. They can get you funded quicker than much of the competition because of their familiarity with the trucking industry. If you have at least 5% of the purchase price as a down payment, and a 600+ credit score, then Smart Finance USA can get you funded for up to $100K. If you’re looking for somewhere to get financed and also get your semi truck, HIGHLY recommend Truck Mart LLC in Shippensburg PA. They have a huge inventory and also finance EVERYONE. Thank you for your comment, Kaylee. Working with someone who specializes in financing for trucking- and transportation-related equipment is a great way to maximize your buying power. Choosing the right dealer can also speed up the buying process, lower your down payment, and more! I was needing to know if anyone has any idea on why my huband and I have been denied for a new truck loan through PACCAR. We own our own truck/trailer at the moment and are in good standing with our original lender (they specialize in used truck sales, so we couldn’t go through them for the new loan). My husband’s credit score is in the high 600’s and mine is in the 700’s. We offered to pay 20 percent down as my husband has only been driving for a little over a year and we know that is a big deciding factor in the process. We fully disclosed all of this to the salesman at the dealership and he made it seem as though that was not going to be a problem – especially considering we already have and have been paying for a truck. When we were denied we were given no explanation (it was the salesman who called us) and our contact in the finance department at PACCAR is not returning our phone calls. We have no bankruptcies and no repossessions, so I am at a loss. I would like to know (other than driving experience) what else they could have denied us for? My husband is wanting to buy a truck and lease on to a company who is ready to hire him as owner/operator. We have at least $10,000 to put down. He is looking at a 2004 with the engine having less then 300,000 miles. His credit score is 620, and mine is 740. What is the process for us to be able to secure a loan? It sounds like you’re in pretty good shape, as far as your credit scores are concerned. Particularly with your credit score being so high at 740. Some lenders might have an issue with your husband’s credit score, as the minimum ranges from 600+ to 660+, depending on the lender. It would be a good idea to work on improving his credit score. The real issue you’ll face has to do with the age of the truck. While it’s good that is has less than 300,000 miles, you’ll have difficulty given it’s more than 10 years old. You might have better luck if you try to find a newer truck to purchase. If you really want this truck, be prepared to provide lots of answers and maintenance records, and there’s still no guarantee that you’ll be able to secure the financing you need. You should look into getting equipment financing for your truck. It sounds like you have more than enough experience, but you’ll need to come up with 10% down to make most of these loans work. It will be difficult to get a loan of this size for a truck if you don’t have that to put down. You can check out Smarter Finance USA for additional information on what your options might be. Insurance is always a necessity when buying a semi truck just because of how much of an investment they are. The article makes a really good point about how, on average, the cost of a semi truck accident is well over fifty thousand dollars. Because of this, you want to make sure that you’ll be covered if you ever do have an accident out their on the road. Thanks for your comment! I agree, insurance is very important. If you’re getting financing then pretty much any lender is going to require that you have insurance on that semi truck prior to them funding the transaction. They’ll want their asset / collateral protected in the event of a large accident. Without that insurance then a wreck could cost both parties to lose out on a large amount of money.